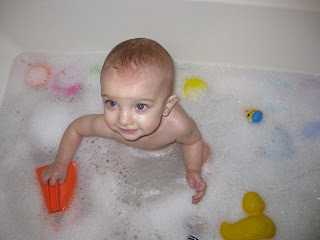 Tonight Owain took his very first bath with Mr.Bubble (the same bubble bath I used when I was a young child). He loved it!!! He loves bath even with out bubbles. Every time I mention bath he points to the bath room door and says "baabaaa" He doesn't quite have the th down but I know what he means. Tonight he was a wild little man in the bath splashing around! My husband Eric and I have been together for five years. I feel incredible blessed to have such an amazing,understanding,fun loving and patient man in my life. For years our only child was our cat Phoebe. Earlier this year we added on to our family and had our first baby boy Owain. We are incredible blessed to have our son and his health. Owain was born with a life threatening birth defect Congital Diaphragmatic Hernia. If you would like to read more about Owain's crazy CDH journey check out his blog.